Advertisers have long been able to track, collect personal information from and serve personalized ads to children wherever they go online. And a recent survey conducted by the Center for Digital Democracy (CDD) and Common Sense Media found that many parents are concerned about such marketing practices used to target their children. To better protect children from predatory tactics in today's digital era, the Federal Trade Commission has released updates to the Children's Online Privacy Protection Act (COPPA). The new rules will refine and clarify COPPA's basic safeguards for putting parents in charge of what personal information can be collected from their children. The FTC has also added new protections specifically designed to address a wide range of platforms and practices that are becoming state-of-the-art in contemporary media culture. But these changes haven't happened without a fight. Children's advocates, privacy groups and health experts have pushed hard to get the government to revise the regulations. Now, after more than two years of public workshops, Congressional hearings, input from a wide variety of stakeholders, and negotiations with the public interest community and industry, the new rules are in effect. 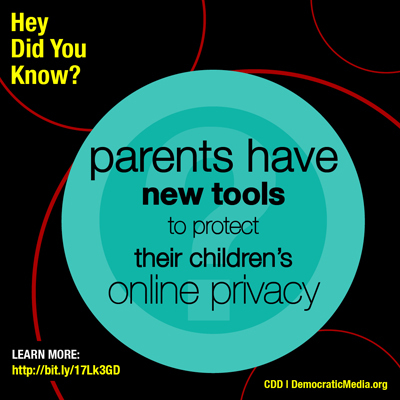 Learn more about the updated regulations and please help parents, the CDD and Common Sense Media continue to hold the children's media and marketing industries accountable by ensuring that they comply with COPPA. If you believe a company is violating the new COPPA rules, you can contact the Federal Trade Commission directly at COPPAhotline@ftc.gov.